Through photographs and drawings this manual describes the work done on two historic tiled stoves in an historic school building in Ekenäs, Finland. It is meant to serve as a guide for anybody who is interested in building or rebuilding a tiled stove of the classical type. The book is a product of joint efforts by students from Novia University of Applied Sciences in Finland, Estonian Academy of Arts in Estonia and Gotland University in Sweden who gathered in Ekenäs for an intensive course about tiled stoves. 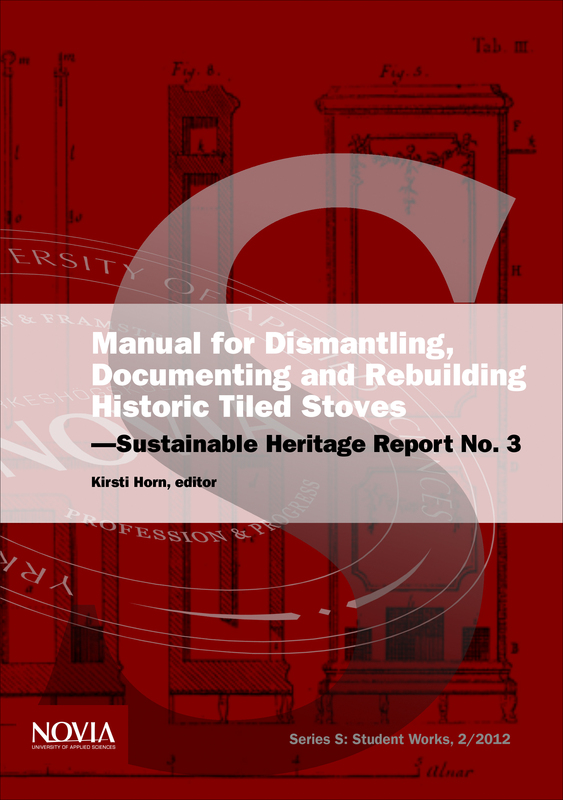 This report is a step by step description of the dismantling and rebuilding of two very tall tiled stoves in an historic school building in Ekenäs, Finland. It is meant to serve as a guide to anybody who is interested in building or rebuilding a classical stove. At the same time this is a report of the hands–on work performed by students from University of Applied Sciences Novia in Finland, Gotland University in Sweden and Estonian Academy of Arts in Estonia during the intensive course Tiled Stoves which was held in Ekenäs in September 2011. This was the third course within the joint project Sustainable Heritage, which is financed by the Nordic Council of Ministers through Nordplus stipends. Tiled stoves have been an integral part of all inhabited rooms around the Baltic Sea ever since the 18th century, when the apparatus was first invented or publicized by Carl Johan Cronstedt and Fabian Wrede, until the 1920’s when central heating technique started to replace the old methods. Today tiled stoves are in fashion again but there are few masons who are familiar with the secrets of the craft of building them. This report gives an idea of the many complicated elements in the work while it describes principles, details, tools and materials that are needed. Please, note that the masonry work is highly specialized and should never be undertaken by dilettantes for the obvious risk of fire. The presented documentation through photographs and measured drawings serve as a good example for similar work within the field of building conservation. – Vaasa: Novia University of Applied Sciences, 2012.